AiClay - a Haven of Miniature Food: So here's a really late Christmas Draw. So here's a really late Christmas Draw. 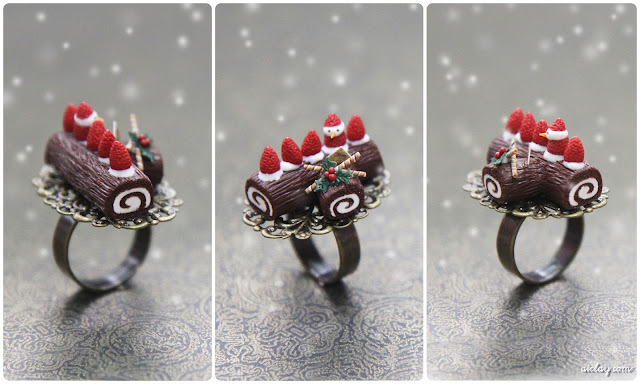 I made a miniature Christmas logcake and perched it on a ring. I was looking through photos of Japanese Christmas desserts and got inspired by the strawberry snowmen, how adorable and creative are those! Pardon the lousy snowdrops effect I made in Photoshop, ahem. This will be for the Christmas Draw, giveaway is international! Head to AiClay's facebook to win it! How cool is this. I'ld love to win this lovely ring. Please count me in. me apunto, puedo ? feliz navidad!